Our four legged friends are part of the family, so when pet messes happen, no need to come unleashed, we’ve got you covered. Introducing Rug Doctor’s New Portable Spot Cleaning Pet Pack designed to remove tough pet messes and stains on the spot. Our four legged friends are part of the family, so when pet messes happen, no need to come unleashed, we’ve got you covered. 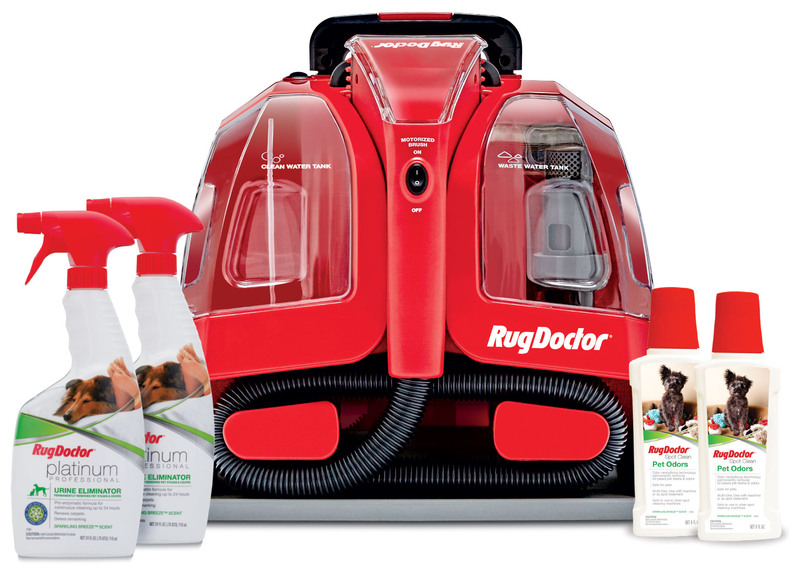 Introducing Rug Doctor’s New Portable Spot Cleaning Pet Pack designed to remove tough pet messes and stains on the spot. With a powerful handheld motorized brush, retractable handle and carpet-friendly wheels, the Rug Doctor Portable Spot Cleaner Faux Paw Pack is engineered to handle the toughest pet stains life throws your way, no matter where they happen. Two times the suction power compared to the competition guarantees a PAWsitive outcome Pet accidents. Pet Beds. Area rugs. Sofas. Chairs. Car Interiors. No matter where the stain and no matter what the source, there’s a Rug Doctor cleaning solution that can handle it.